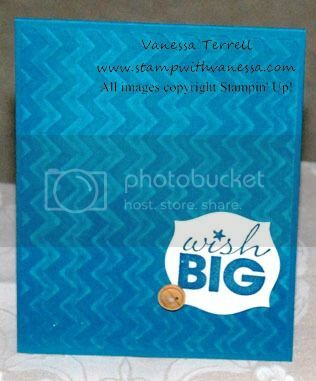 Stamp with Vanessa: Wish Big for the Guys! Wish Big for the Guys! Hi Friends! Do you struggle with making masculine cards of any type? Don't feel bad, I struggle as well. Today I thought I would share with you a masculine birthday card, that could easily become a feminine card with just a change of colors and embellishments. I must admit that I did not come up with this card on my own, remember I said that I struggle as well. So I found my inspiration in this years annual catalog right on page 179. If you know me, you know that I tend to use the Brights collection quite often and this card uses one of those colors! Although, it wasn't a color that I would use often, but it was a fun color to use. The card in the catalog wasn't a birthday card, so I made a few changes so that it would fit my needs. This card used the Big Shot, everything is better with the Big Shot...right? So are you ready to have a look at finished card? Do you see what I mean about it being a card that you could easily change up the colors and embellishments to make it feminine? I think I will make that a priority this week to make some more of these cards using some different embossing folders and buttons....I can't wait to see how it changes the look of the card! 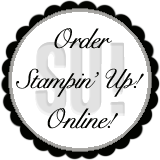 Click here if you would like to place a Stampin' Up! order.